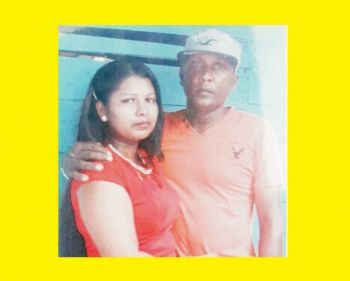 BERBICE, Guyana, SA - Residents in and around the Kilcoy/Chesney area were sent into shock and dismay as the news of the gruesome murder/suicide circulated. Neighbours and residents swarmed the location of the alleged crime while investigators were already on the scene. According to reports, an Albion Estate labourer at approximately 13:35 hrs at Lot 101 Chesney New Scheme, Corentyne, Berbice, brutally murdered his wife of 15 years. Dead is Rohini ‘Sabrina’ Lakhan, 29, a housewife and her killer husband, Ramesh Ramdeen, 42. The couple shared three children together, ages 14, eight and six. Reports are that Ramdeen while being in a relationship with Lakhan, would normally abuse her physically and verbally. On many occasions, he accused her of engaging in extra marital affairs. Yesterday, the couple attended the Albion Magistrate’s Court for a domestic violence matter. There a protection order was secured against Ramesh and she requested to move out from the home that they shared together. He was also ordered to pay child support at $5,000 for each child. Shortly after the case concluded, Sergeant Vanessa Williams and patrol vehicle driver, Constable Anys, accompanied the couple back to the house to uplift Lakhan’s clothing since she made a decision to separate from her husband. Ramdeen’s sister was also present at the home with the police. However, the police and Ramdeen’s sister subsequently left. About 13:35 hrs neighbours heard screams emanating from the home. She was heard telling her husband that she will no longer leave and was suspected to be in fear of what he was about to do to her. Within minutes, there was a suspicious silence, neighbours had already determined the worse. The ranks from the Albion Police Station were summoned. When the police arrived and forced their way into the locked two-storeyed wooden building, the mother of three was discovered lying on her abdomen in a southern bedroom in the upper flat in a pool of blood with her throat slit. Lying just beside her lifeless body was a cane cutter cutlass covered in fresh blood. Near to the bedroom, there was a trail of blood on the indoor step leading to the bottom flat. There Ramdeen’s body was found lying on his back also in a pool of blood with his throat slit. It is suspected that he slashed his throat after killing his wife and tumbled down the inner stair way. Speaking to the distraught sister of the now dead woman, she explained that the couple had been together for 15 years but only lived at the location of the crime for four years. She said that over the 15 years, her sister suffered tremendously due to Ramdeen’s abusive ways. “For fifteen years, she going through with this domestic violence and many times she tried to leave him but he always beg and she does come home back for the sake of her children”, the woman said. According to her, after court, the police accompanied her sister home to uplift her belongings but she questioned why the police left her sister alone with Ramdeen given the situation. “The officer, Williams, come with her and left her to do the packing up, and she gone. Just the officer left this yard and gone, he kill she”. The sister exclaimed that the police rank was bribed to leave the home by the man’s sister who was present at the home. “Dem tek money fuh buy fried rice and drinks. That is what dem does do at that station. They always doing that”. She argued that the police were out of order to leave the woman unprotected with her husband in the home with her. The police claimed that they were told by Lakhan that she no longer wanted to move out and that she told them to leave, the mother of the dead woman, Monica Lakhan is disputing that theory. She told Kaieteur News that she called her daughter shortly after the court case concluded and Ramdeen’s sister answered the phone. “When she answer, me ask she fuh talk to ‘mama’ and she tell me how she deh packing up she clothes and how police deh down deh with she. Me tell de police me na want that man near me daughter and she tell me how Ramesh can’t do me daughter nothing. Me ask fuh talk to me daughter and the last thing me hear from she was ‘Ma me ah pack up me clothes and come”. According to the mother of the dead woman, her daughter was staying with her for the past week and she had made up her mind to end the turbulent relationship she shared with the labourer. Ramdeen is believed to have been angered by his wife’s decision to leave him, leading to his beastly actions. Another sister who was present at the scene, Nalini Ramjattan, said that she received a call saying that her brother-in-law had murdered her sister. She said when she arrived, she saw her sister’s bloody body sprawled on the bedroom floor with blood oozing from her neck and wrist. “Me see me sister lie down pon da floor with she neck slash and then when me watch, me see ah man pon the bottom floor like he topple pon the step and fall and dead deh”, Nalini said. She opined that if the police had remained with her sister, she would have been alive today. As the undertakers brought the bodies out from the home, relatives of the woman screamed and tugged on the corpse on the stretcher. The police were forced to restrain the family. They wanted to get a glimpse of Lakhan’s body before the hearse took the body away. They were also seen shouting at the Sergeant who was with their sister before she died. “Why you remove your name tag, I know you Williams”. Very, very sad. Those police did that lady injustice. I believe they accepted bribe in truth. This woman just came from court, her mind would still be for leaving that dog, don't believe the po po. Dem too lie. THE POLICE VERY OBVIOUSLY NEGLIGENT IN THIS MATTER, WHO DOES GO TO COURT AND RIGHT AFTER CHANGE THEIR MINDS? ITS POSSIBLE, BUT THEY SHOULDA NEVER LEFT THAT LADY ALONE WITH THE PERSON SHE ACCUSED OF PHYSICALLY AND VERBALLY BEATING HER! !